The wall dates back to the Iron Age but whether it was built on an earlier wall or not will come to light with further excavations in the next few years. Archeologists at Adana's Sirkeli Mound have uncovered a double-skin wall dating back to the Iron Age. Located in the city's Ceyhan district, the wall bears the traces of a war. 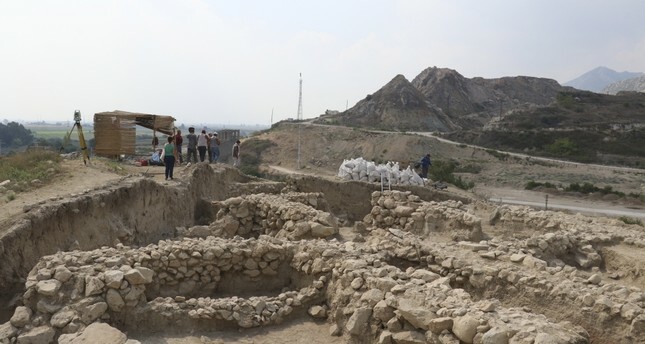 The excavations at three different locations of the mound are being led by professor Mikro Novak from Switzerland's Bern University and the Ministry of Culture and Tourism. A team of 37 local and foreign experts and 40 workers from the nearby Sirkeli village are working at the site. The defensive wall and waterways were discovered at the lower city part of the mound. Speaking to Anadolu Agency (AA) professor Novak said that the first excavation works at the Sirkeli Mound began in 2006, with the collaboration between Germany's Tübingen University and Çanakkale's Onsekiz Mart University. "Bern University took over the work at the site in 2012," Novak said, adding that they continue to work in Sirkeli, which is an important location for historical settlements and ruins. He added that they have also discovered stores and seeds on the upper part of the mound. They date back to the Iron and Early Bronze Ages. "We will continue to look at the seeds," he said. Novak said they found the wall after geophysical and surface researches that were conducted in the lower city of the mound. Excavation works have started in the light of that data. He said that works continue at nearly 2.5 meters below the surface at the moment. "A double-skin defensive wall system dating back to the Iron Age was found during excavation. There are also houses belonging to various settlements in the inner part of the inner walls. There are some traces on the outer walls as well. They show how soldiers attacked the walls with their spears. We know that Shalmaneser III started a war against this region in 835 B.C. The carbon-14 samples and ceramics from here show this wall dates back to the 9th century B.C.," he added. Novak added that they also found a stamp seal with Luwian hieroglyphics and Babel cuneiforms. "We also discovered ceramic and metal workshops in the inner part of the walls," he said.